Buy shares in the railway companies. 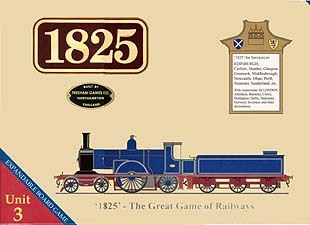 Build railways by laying tiles on the map board. Buy trains and run them on the routes you have built. Earn money which may remain in the Company or be paid out to the Shareholders. Watch the railways grow and see the share prices rise (and fall) with Company fortunes. Unit 3 may be combined with Unit 2 (The Midlands) and with the Regional Kit R4 (The Highlands). Extension Kits K1 to K9 may be added as desired. '1825' for Services to: Edinburgh, Carlisle, Dundee, Glasgow, Grennock, Middlesbrough, Newcastle, Oban, Perth, Stranraer, Sunderland, etc. With connections for London, Aberdeen, Barnsley, Crewe, Darlington, Derby, Doncaster, Horwich, Inverness and other destinations.